The UK system of corporate governance is generally seen as an effective model that has influenced many other jurisdictions in Europe and Asia. This helps to attract international companies wishing to gain access to a wide pool of investors, who are reassured by the governance obligations placed on issuers regardless of where their key business operations are located. In this chapter we focus on UK-incorporated companies with a premium listing on the Main Market of the London Stock Exchange. Requirements are relaxed to a degree for companies that are only able (or only choose) to obtain a standard listing, or that are not UK-incorporated companies. The United Kingdom’s corporate governance system comprises laws, codes of practice and market guidance. Mandatory and default (i.e., ‘opt-in’ or ‘opt-out’) rules and legal standards derive from common law, from statute (notably the Companies Act 2006 (the Companies Act)) and from regulation (notably the Listing Rules and the Disclosure Guidance and Transparency Rules published by the Financial Conduct Authority (FCA), which is a statutory body). Some of these laws and regulations derive from European law, but some are specific to the United Kingdom. The City Code on Takeovers and Mergers (the Takeover Code) also has an important role to play in control-seeking transactions, and has statutory force. Each company’s constitution, which will also impose governance requirements, has legal effect as a statutory contract between the company and its members. The most important code of practice is the UK Corporate Governance Code (the Code), which is published and updated periodically by the Financial Reporting Council (FRC), which is also a statutory body. The current edition of the Code was published in 2016. The FRC is currently undertaking a comprehensive review of the Code and, in December 2017, published a revised Code (the Revised Code) for consultation. In 2010, the FRC also published the UK Stewardship Code (the Stewardship Code), which applies to the institutional investor community and not to companies directly. The FRC intends to review the Stewardship Code following consultation on the Revised Code to ensure it continues to drive best practice in enhancing the quality of engagement between investors and companies. Finally, guidelines from the institutional investor community supplement these laws, regulations and codes of practice. effective rights for shareholders (including a binding ‘say on pay’ and without-cause removal rights), who are encouraged to engage with the companies in which they invest. One defining feature of the Code is the ‘comply or explain’ approach: rules for companies with a stock exchange listing (the Listing Rules) require all companies either to comply with the Code or to explain why they do not. The Code is issued with an acknowledgement of flexibility; this is in recognition of the principle that no single governance regime would be appropriate, in its entirety, for all companies. This approach does, however, rely on shareholder engagement to challenge non-compliance where appropriate. Nevertheless, in December 2017, the FRC noted that 95 per cent of all FTSE 350 companies (the 350 largest UK-listed companies, by market capitalisation) reported full compliance with the Code, or full compliance with all but one or two provisions. In many cases, non-compliance is due to circumstances rather than deliberate choice. This confirms that the provisions of the Code are widely adopted by companies despite the comply-or-explain philosophy. The Code states that an explanation for non-compliance should set out the background, provide a clear rationale that is specific to the company, indicate whether the deviation from the Code’s provisions is limited in time and state what alternative measures the company is taking to deliver on the principles set out in the Code and to mitigate any additional risk. For the past two years, the UK system of corporate governance has been the subject of political and media scrutiny. Much has focused on the responsibilities of business to a wider set of stakeholders. The proposals in the Revised Code envisage more companies becoming subject to its standards, removing exemptions for public companies outside the FTSE 350 and extending certain governance principles to large private companies. This trajectory should be borne in mind, but this chapter will note where a specific governance requirement is likely to change in the near future. The UK system features a unitary board. There is no two-tier structure – executive directors and independent, non-executive directors instead act together as one board. There is currently no co-determination principle in the United Kingdom requiring seats on the board to be reserved for employee representatives, although this was actively debated in the immediate aftermath of the June 2016 general election. The company’s powers are exercised by its board acting collectively, with a small number of decisions requiring shareholder approval. In practice, substantial managerial authority is delegated by the board to the company’s executives; the board appoints the executives and exercises an oversight function by approving decisions that do not require shareholder approval and that have not been fully delegated. Standing committees of the board typically include at least a nomination committee, audit committee and remuneration committee; but the creation of other standing committees, or ad hoc committees to exercise delegated powers, is permitted. As its most significant new proposal, the Revised Code introduces workforce representation at board level. The current proposal is for companies to choose from three options: a director appointed from the workforce; a formal workforce advisory council; or a designated non-executive director with specific responsibility for ensuring that the views of the workforce are represented to the board. The Code recommends that the board and its committees should have an appropriate balance of skills, experience, independence and knowledge of the company to enable them to discharge their respective duties and responsibilities effectively. At least half of the board, excluding the chairman, is required to comprise individuals determined by the board to be independent. This way, no individual or small group of individuals can dominate the board’s decision-making. It is the CEO, though, who is responsible for delivering the agreed strategy and for day-to-day running the company’s business. The criteria for determining whether a director may be regarded as ‘independent’ are set out in the Code. A director will not be regarded as independent if he or she has been an employee of the company or its group within the past five years; has, or has had within the past three years, a material business relationship with the company; has received or receives additional remuneration from the company apart from a director’s fee, participates in the company’s share option or a performance-related pay scheme, or is a member of the company’s pension scheme; has close family ties with any of the company’s advisers, directors or senior employees; holds cross-directorships or has significant links with other directors through involvement in other companies or bodies; represents a significant shareholder; or has served on the board for more than nine years from the date of his or her first election. The Code requires that the board constitute a nomination committee, an audit committee and a remuneration committee. The strength and independence of these committees – whose particular duties are addressed in the Code and in recommended terms of reference published by the Institute of Chartered Secretaries and Administrators – is a key factor in ensuring effective corporate governance, although ultimate responsibility for areas addressed by these committees remains with the board collectively. Some boards also constitute a risk committee that is separate from the audit committee and has responsibility for overseeing risk exposure and future risk strategy. The Code recommends that the audit committee should comprise at least three directors, all of whom are independent and one of whom should have ‘recent and relevant financial experience’. The chairman of the board should not be a member of the audit committee. The nomination committee should comprise a majority of independent directors and be chaired by an independent director. The chairman of the board can be a member of (and chair) the nomination committee. The remuneration committee should comprise at least three independent directors. The chairman of the board may sit on (but not chair) the remuneration committee, provided he or she was independent on appointment. The separation of chairman and CEO is one of the key ‘checks and balances’ of the UK system. It has been recognised for some time that combining the roles increases the likelihood of one individual having unfettered decision-making powers. The Code recommends splitting the role of chairman and CEO, and that the division of responsibilities between the two positions should be clearly established. If the roles of chairman and CEO are combined (or if the CEO succeeds as chairman), this must be publicly justified in accordance with the comply or explain principle, and the company should expect close questioning from institutional investors. The Code states that levels of remuneration should be sufficient (but not higher than necessary) to attract, retain and motivate directors of the quality required to run the company. A significant proportion of executive directors’ remuneration should be structured to link rewards to corporate and individual performance (but pay for non-executive directors should not include performance-related elements). Levels of executive remuneration have been heavily criticised by the public and in the media recently. In December 2017, the CEO of the housebuilding firm Persimmon was awarded a bonus of more than £100 million, which was widely criticised in the media and by politicians, and led to the chairman resigning over the design of the director bonus scheme. Shareholders of UK-incorporated, listed companies have a binding vote on the company’s directors’ remuneration policy. In broad terms, shareholders are required to approve, at least every three years, a policy setting limits and conditions for directors’ remuneration. If payments and awards made by the company to its directors are not consistent with the shareholder-approved policy, they are recoverable from the director in question and the directors responsible for approving the unauthorised payment or award are liable to compensate the company. Shareholders have, in addition, retained their annual advisory (i.e., non-binding) vote on the implementation of the approved policy during the previous year. Companies are also obliged to publish a report on the directors’ remuneration in their annual report, including the remuneration policy in the years it is being put forward for approval. This regime does not apply to employees or consultants who are not directors. Lastly, where a company has 250 or more employees, it is also required to publish statutory calculations each year showing the size of the pay gap between male and female employees. The Revised Code gives an expanded remit to the remuneration committee to oversee company remuneration and wider workforce policies, primarily facilitated through enhanced engagement with the workforce. It also proposes that the board is able to override remuneration outcomes, for example, where the measurement of a performance condition does not reflect the actual performance of the individual director. The government is also considering secondary legislation that would require clearer reporting on incentive schemes and disclosure of the pay ratio between the CEO and an average UK employee of the company. The role of the independent director is seen as essential in providing a balance on the boards of listed companies, and the Code and related guidance emphasise the need for independent directors to be suitably experienced, committed and prepared to challenge the executive directors. The Code emphasises the need for the board to establish the correct ‘tone from the top’. The primary function of independent directors, according to the Code, is to scrutinise the performance of management and monitor the reporting of performance. The board should appoint an independent director to be the ‘senior independent director’, to provide a sounding board for the chairman and to serve as an intermediary for the other directors when necessary. The senior independent director should be available to shareholders if they have concerns that contact through the normal channels of chairman, CEO or other executive directors has failed to resolve, or for which such contact is inappropriate. The FRC’s Guidance on Board Effectiveness (2011) further emphasises the critical role of the senior independent director to help resolve significant issues when the board is under periods of stress. Independent directors should hold meetings without the executives present both with the chairman and, at least annually, without the chairman (led by the senior independent director) to evaluate the chairman’s performance. In practice, independent directors generally meet with the other directors for board meetings at least eight times per year in addition to attending committee meetings. They should (and often do) have direct access to all staff below board level and all advisers and operations, and receive information at an early stage (before executive directors have made key decisions). The Code provides that, as part of their role as members of a unitary board, independent directors should constructively challenge and help develop proposals on strategy. On the other hand, a ‘conscientious and independent standard of judgement, free of involvement in the daily affairs of the company’ is seen as an independent director’s key contribution to the boardroom. In this regard, the board is required to determine annually whether a director is independent in character and judgement and whether there are relationships or circumstances that are likely to affect the director’s judgement. Independent directors should also monitor the performance of management in meeting agreed goals and objectives, and the reporting of performance. They should satisfy themselves on the integrity of financial information and that financial controls and systems of risk management are robust and defensible. They are responsible for determining appropriate levels of remuneration of executive directors and have a prime role in appointing and, where necessary, removing, executive directors, and in succession planning. to declare any interest in a proposed transaction or arrangement with the company. These statutory duties must still, however, be interpreted and applied in accordance with the preexisting common law duties. Indeed, in respect of some directors’ duties that have not been codified under the Companies Act, the common law rules remain the only relevant law. These include the duties not to fetter their discretion, not to make unauthorised profits by reason of their office and to keep the affairs of the company confidential. the likely consequences of any decision in the long term, the interests of the company’s employees, the need to foster the company’s business relationships with suppliers, customers and others, the impact of the company’s operations on the community and the environment, the desirability of the company maintaining a reputation for high standards of business conduct, and the need to act fairly as between members of the company. 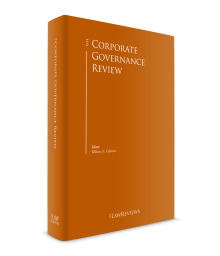 Much recent discussion of corporate governance reform has centred on the duties companies owe to wider stakeholders. The Revised Code seeks to ensure that companies are more open and accountable to their stakeholders, and particularly their workforce. The government also plans to introduce secondary legislation for large companies to report on how directors have discharged their duty to consider the above-mentioned stakeholders. None of these developments will authorise directors to prefer the interests of other stakeholders to those of the shareholders, nor still give other stakeholders any ability to enforce these requirements of ‘other-regarding’ in decision-making. UK law takes a relatively strict approach to the enforcement of directors’ duties. For example, unauthorised self-dealing is not reviewed ex post against an ‘entire fairness’ standard, as it might be in Delaware; rather, the transaction is in principle voidable at the instigation of the company without any inquiry into its fairness. Breach of duty is in principle actionable only by the company to which the duty is owed, and not by its shareholders or creditors. While a shareholder may bring a derivative action on behalf of the company in relation to actual or threatened breaches of duty, the UK legal system is not well suited to private enforcement of directors’ duties outside formal insolvency proceedings, so litigation by shareholders of a listed company alleging breach of duty by its directors is extremely rare. In relation to control-seeking transactions (i.e., any proposed acquisition of 30 per cent or more of the voting rights), the Takeover Code requires shareholder approval for any proposed action by the directors that may result in any offer (or expected offer) for the company being frustrated, or in shareholders being denied the opportunity to accept or reject the offer on its merits. Viewed in isolation, this prohibition against ‘frustrating action’ seems draconian and almost equivalent to a presumption of bad faith; however, potential prejudice to the target company’s shareholders is mitigated by the Takeover Code’s strict regulation of the terms and timing of any proposed control-seeking transaction. Other legislation imposes criminal and civil liability on directors, including health and workplace safety laws, environmental laws and competition and securities laws. The Code provides that there should be a formal, rigorous and transparent procedure for the appointment of new directors to the board. The search for candidates should be conducted, and appointments made, on merit, against objective criteria and with due regard for the benefits of diversity on the board, including gender. A nomination committee should lead the process for board appointments and make recommendations to the board. Independent directors should be appointed for specified terms subject to annual re-election. The Code refers to the need to ensure progressive refreshing of the board so that any term beyond six years for an independent director should be subject to particularly stringent review. The Code states that all directors should be re-elected annually by shareholders. Each director’s election is voted on separately, with statute requiring majority rather than plurality voting (i.e., an ordinary majority of shareholders can vote against – and hence block – a director’s election). In theory, an ordinary majority of shareholders also has a statutory right to remove a director at any time and without cause, but regular re-election renders this right largely irrelevant in practice. Consequently, there is no concept of a ‘staggered board’ under UK law. The board should satisfy itself that plans are in place for orderly succession of appointments to the board and to senior management, so as to maintain an appropriate balance of skills and experience within the company and on the board and to ensure progressive refreshing of the board. The Hampton-Alexander Review (2016 and 2017) and the Parker Review (2017) have both made a series of recommendations for companies to further gender and ethnic diversity, respectively, at board level. The Parker Review recommended that all FTSE 100 boards should have at least one director from an ethnic minority background by 2021, and the same for FTSE 250 boards by 2024. The Hampton-Alexander Review set a target of 33 per cent women on FTSE 350 boards and 33 per cent women in FTSE 100 executive leadership teams by 2020. Both also make a number of recommendations to facilitate attainment of those targets. The Revised Code seeks to reflect these findings and recommendations in asking boards to intensify their efforts. Nomination committees will be required to ensure a diverse pipeline for succession, and the annual report will be required to explain actions taken to increase diversity and inclusion, as well as the outcomes. The Revised Code also recognises a wider concept of diversity, which covers gender, social and ethnic backgrounds, cognitive and personal diversity. The Listing Rules already require that companies’ annual reports include a description of the diversity policy, how it is being implemented and the results. Companies are required to prepare and publish audited annual financial statements (prepared in accordance with EU-adopted international financial reporting standards) and to make these available to shareholders within four months of the financial year end and in time for the annual general meeting. These form part of the company’s annual report, which must include elements of narrative reporting along with the audited financial statements. The annual report must include a strategic report in addition to the directors’ report, the purpose of which is ‘to inform [shareholders] and help them assess how the directors have performed their duty’ to promote the success of the company. In addition to ‘a balanced and comprehensive analysis of both the development and the performance of the company’s business during the financial year, and the position of the company’s business at the end of that year’, the strategic report must contain a description of the principal risks and uncertainties affecting the company’s business, information about the gender split for its directors, managers and employees, trend information and disclosure about certain environmental matters. The Code recommends that it also include a description of the company’s business model and strategy. At the end of 2014, the Competition and Markets Authority issued an order requiring FTSE 350 companies to put their audit engagement out to competitive tender at least every 10 years. The Listing Rules require the publication of a half-year report within three months of the end of the relevant six-month period, containing a condensed set of (unaudited) financial statements and an interim management report. The interim management report must include details of any important events in the relevant period, the principal risks and uncertainties for the remaining six months and details of related-party transactions. Companies are required to disclose promptly all dealings in their securities (including non-voting securities) by ‘persons discharging managerial responsibilities’ (PDMRs) and certain connected persons. Companies are also required to take all reasonable steps to ensure that their PDMRs and persons connected with them comply with the Market Abuse Regulation on dealings in securities. In general, this prohibits all dealings during defined ‘close periods’ (in the 30 days prior to the publication of certain interim or any annual reports) and at any time when a company is in possession of price-sensitive information, subject to certain exceptions. Even when not absolutely prohibited, dealings by PDMRs and their connected persons above a de minimis threshold must be notified to the company and the FCA. A person acquiring 3 per cent of the voting rights in a company must notify the company, which is in turn required to make prompt disclosure to the market. Disclosure is also required thereafter whenever that person reaches, exceeds or falls below each additional 1 per cent threshold. The Listing Rules require ‘significant transactions’ by a listed company to be disclosed to shareholders. Moreover, Class 1 (i.e., large, measured by reference to profits, assets, gross capital or consideration) transactions require not only disclosure but also shareholder approval by simple majority resolution. In addition to certain shareholder approval requirements under the Companies Act, the Listing Rules require independent shareholder approval by simple majority resolution for ‘related-party transactions’, unless they fall within certain exceptions (e.g., small related-party transactions). ‘Related parties’ include PDMRs and shareholders holding more than 10 per cent of the voting rights, and persons connected with them. The Listing Rules also require a proposal for approval of a related-party transaction to be accompanied by an independent ‘fair and reasonable’ opinion, typically from an investment bank. At the same time, the Code was amended to require an explicit statement in the financial statements about whether the ‘going concern’ basis of accounting has been adopted, and whether there are any material uncertainties about the company’s ability to continue to do so in future. Moreover, companies are now also required to include in their annual report a broader statement about the board’s reasonable expectation as to the company’s viability, based on a robust assessment of the company’s principal risks and current position. This information should give investors a clear and broad view of solvency, liquidity, risk management and viability. The Investment Association advises that the directors should consider, for example, the sustainability of dividends and how risks are prioritised. Auditing standards impose obligations on auditors to review and challenge these statements. Under the Companies Act, shareholders have the power to challenge a board in several ways. As few as 100 shareholders or shareholders holding as little as 5 per cent of the voting rights (whichever is less) can requisition a meeting and add any item to the agenda or add any item to the agenda for the company’s AGM; moreover, there is no minimum holding period to qualify. In practice, however, boards are relatively responsive to shareholder concerns and such requisitions are rare because each director must submit to annual re-election and because directors are in any event required to obtain shareholder approval for a number of matters, requiring relatively frequent engagement with the company’s main shareholders. Under the Companies Act, shareholders must approve secondary share offerings by simple majority resolution, and, in any event, shareholders enjoy statutory pre-emption rights on all secondary share offerings for cash, although they can approve the disapplication of these pre-emption rights by special resolution (i.e., 75 per cent of shares voted). In practice, shareholders typically give directors general authority to issue further shares for cash and on a non-pre-emptive basis within certain guidelines published by institutional investors (e.g., no more than 5 per cent of the company’s share capital in any year, and no more than 7.5 per cent on a rolling three-year basis (or an additional 5 per cent in connection with an acquisition or specified capital investment), and then subject to restrictions on the price at which the shares may be issued). Authority to issue further shares is typically renewed at each AGM or sought in relation to a specific transaction where equity funding is required. Shareholders are also required to approve the terms of share incentive plans and Class 1 transactions such as major acquisitions or disposals (in each case by simple majority), related-party transactions (by simple majority of independent shareholders), as well as any changes to the company’s constitution or the rights attaching to their shares (by special resolution). Any proposal to acquire control (defined as 30 per cent or more of the voting rights) of a company subject to the Takeover Code requires an offer to be made to all shareholders on the same terms unless minority shareholders waive this ‘mandatory offer’ obligation. Finally, shareholder approval (by way of simple majority) is required under the Companies Act for loans and other credit transactions, and for ‘substantial property transactions’, with directors and their connected persons (although in practice the provisions of the Listing Rules cover many more such related-party transactions). When more than 20 per cent of votes have been cast against any resolution or any resolution has been withdrawn, the Revised Code will require companies to announce what actions it intends to take to consult with shareholders in order to understand the reasons behind the result. The Investment Association has also launched its Public Register to aggregate publicly available information regarding meetings of any FTSE all-share company following significant shareholder opposition to a proposed resolution. A general shareholder equality principle pervades both UK company law and the Listing Rules. There is a ‘one-share, one-vote’ norm, and distributions to shareholders (dividends, share repurchases, etc.) are required to be made anonymously ‘on market’ and on tightly regulated terms unless shareholders waive these requirements. In principle, information must be made available simultaneously to all shareholders, although in practice it is possible to inform key shareholders of significant proposals in order to take ‘soundings’ on a confidential basis, although this precludes shareholders from dealing in the company’s securities until the information has been made public or ceases to be price-sensitive. English law imposes little in the way of active duties or liabilities on shareholders. A majority shareholder does not owe any fiduciary duty to the company or to the other shareholders and is free to exercise its voting rights to advance its own interests, except where it is barred from doing so because of its interest in a proposed transaction. Certain non-binding expectations are placed on investors by institutional guidelines, by the Code and by the Stewardship Code, reflecting the belief that self-interest of investors is necessary to ensure effective governance. The Stewardship Code for institutional investors encourages them to be more proactive in their role as shareholders. Under the Stewardship Code, institutional investors are required to exercise their votes in respect of all the shares they hold and not to support the board automatically. Institutional investors are expected to disclose on their websites how they have applied the Stewardship Code or, if they have not, to explain why not. In 2016, the FRC categorised signatories of the Stewardship Code into three tiers based on the quality of their Code statements. Of roughly 300 signatories, more than 120 were in Tier 1, up from about 40 at the beginning of the exercise. The Listing Rules contain the concept of a ‘controlling shareholder, who (either alone or together with others ‘acting in concert’ with it, is able to control 30 per cent or more of the voting rights). Affected companies must enter into a ‘relationship agreement’ with their controlling shareholder containing certain mandatory terms intended to ensure that the board will remain independent of improper influence by the controlling shareholder. Companies with a controlling shareholder are also subject to additional disclosure requirements, and certain matters require the approval of shareholders independent of the controlling shareholder. While institutional investors have traditionally been reluctant to act as the policemen of the corporate governance regime, an increasing number have recently become more vocal. Where institutional investors do have criticisms, they are more likely to engage in private dialogue with the directors. In recent years, however, they have been increasingly involved in activist campaigns, alongside traditional activists such as hedge funds. What distinguishes shareholder ‘activists’ is that they are prepared to air issues publicly to achieve change. Much activism is still concerned with securing board representation or building stakes; however, executive remuneration and perceived corporate governance failings at listed companies are also focuses. In 2017, the largest institutional investor in Sports Direct sold its entire 5.8 per cent holding, and another institutional investor sold down its stake following their sustained public criticism of Sports Direct’s corporate governance failings. A company’s relations with its shareholders are also specifically addressed in the Code by providing for a dialogue with shareholders based on the mutual understanding of objectives and that the board as a whole has responsibility for ensuring that a satisfactory dialogue with shareholders takes place. The board should keep in touch with shareholder opinion in whatever ways are most practical and efficient, using the AGM to communicate with investors and encourage their participation. It would be extremely difficult for the board of a UK company to unilaterally adopt anything equivalent to a shareholder rights plan, or to issue shares to a white-knight bidder to block a hostile takeover. For better or worse, takeover regulation in the United Kingdom strongly favours the short-term interests of shareholders by depriving the board of anything other than the power to persuade shareholders to reject an unwanted offer. 2017 has been a year of significant activity on the corporate governance front. Political and media pressure have both reinvigorated the debate around the importance of a company’s other stakeholders. While many proposals have been watered down since first suggested, they are starting to manifest themselves. Looking ahead, 2018 will see many of the proposals of 2017 take effect, and companies will be required to grapple with their meaning. The general trend is clear though: businesses must be more accountable to their stakeholders. 1 Murray Cox is a partner and Hayden Cooke is an associate at Slaughter and May.